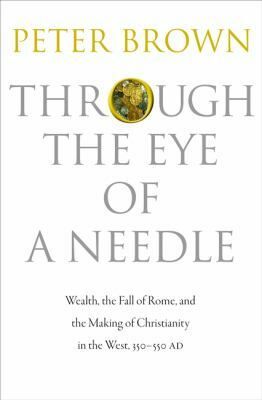 Wealth in the Roman Empire in the 4th Century AD, was as unequally distributed as it is today. Riches derived from the fruits of the land, expansion of the tilling of the soil and favorable planting conditions. Rich farmers would intermarry with other wealthy landowners, so the profits would be kept within the family. Well off families would create magnificent villas, and in time the Fabulous City of Rome with its overarching Emperor. A lot of wealth was also created by using a slave class to do work that was not compensated. Slaves were imported from conquered territories throughout the Empire. In order to keep the slave and working classes pacified, in the cities, the wealthy patrons of Rome held almost daily Games and Circuses that were free to the general public. While attending these events the common folk could forget their wretched lot for a while. The writings of Augustine (City of God), Ambrose and Jerome amplify this thesis as the Roman Empire begins to disintegrate at the end of the 4th Century, due to Barbarian invasions and widespread internal corruption. I enjoyed listening to Hattie Ever After, although I’m not sure if I read Kirby Larson’s first book, Hattie Big Sky. Hattie is now 17, an orphan, and working at a boarding house in Great Falls, Montana. Her friend Perrilee wants her to move to Seattle, and her boyfriend Charlie, just back from World War I, wants to get married. But Hattie has a dream, and impulsively takes a job as seamstress to a vaudeville troupe that is heading to San Francisco. Hattie’s big dream is to be a reporter for the San Francisco Chronicle. She gets a job at the paper, but no writing is involved. Her entry-level job seems to pay pretty well, and she’s saving money to visit Perrilee. But then her new friend Ruby Danvers, who knew Hattie’s Uncle Chester, needs the money to visit her daughter. Ruby is quite friendly, but is not what she seems. Hattie eventually gets some chances to write for the paper, beginning with a bet to get an assignment to cover a baseball game. A minor earthquake, an opera star who want to go flying and a visit from President Wilson provide some more opportunities. But Hattie has to decide just how important her dream is. San Francisco in 1919 comes to life, and Hattie is great company and often funny. I thought the narrator, Kirsten Potter, had a more mature voice than expected for a teenager, but was otherwise excellent. The author spent a lot of time with maps, online newspaper archives, and an old city directory to make San Francisco seem authentic. Now I need to listen to Hattie Big Sky, about her earlier adventures on a homestead in Montana. Miss books like “The Help”? Can’t get enough of mid-century historical novels? Love to discover new authors? This book by new author Julie Kibler is a true winner, a poignant, tragic tale of forbidden love between Robert, a young African American teen in 1939 Kentucky and his lady love, 17-year-old Isabelle, who is torn between societal norms and her passionate love affair. The story is told in hindsight by 90-year-old Isabelle to her dear friend and hairdresser, Dorrie, who has agreed to accompany Isabelle to a funeral that she knows nothing about. As the story unfolds, it was shocking to read the racial prejudices that occurred, but it is still eye opening to read the similarities of prejudice, even today. I must say, this definitely does not read like a debut novel! Kibler writes similarly to Kathryn Stockett, especially as she draws from the experience of her own grandmother in telling this story. The characters are very well developed, and the story develops at a very quick pace. You won’t be able to put this one down! I like cookbooks. I select them for the library’s collection, and I also collect them, skim them, look at the photos, flag promising recipes, and bake or cook recipes from each. But I don’t generally read them out loud. Deb Perelman’s entertaining first book, The Smitten Kitchen Cookbook, was meant to be read out loud. She is young, has a tiny New York City kitchen, a husband, and a toddler. She also loves to cook and entertain, and find new dishes at a restaurant and then experiments (or obsesses) with getting them just right in her kitchen. Her wildly popular blog, smittenkitchen.com, is full of recipes and observations on food and life. In the cookbook, the notes for each recipe are often hilarious, and guaranteed to make you hungry. I’ve already tried a few recipes, and my coworkers at the library agree that Deb’s Brownie Roll-Out Cookies are delicious. Sometimes I want something lighter to read, especially when I need an audiobook to listen to when I’m driving. Susan Elizabeth Phillip’s characters are very good company if you want a romance with some comedy. This is a companion book to Call Me Irresistible, and they can be read in any order. Lucy Jorik is the former president’s adopted daughter, and feels the need to live up to that responsibility. When she finds out at the last minute that she just can’t marry her perfect fiance, Ted Bodine, she panicks and runs away in a choir robe and heels. Wedding guest Patrick, who goes by Panda, gives her a ride on his motorcycle, and they end up on a road trip with Lucy in disguise to escape the press. Panda, although he wears offensive t-shirts, is very attractive and Lucy falls for him. Later, Lucy decides to track him down and ends up staying in his summer house on an island in Lake Michigan. She needs to do some writing for a book about her famous mother, but keeps getting sidetracked. We meet Bree, who has just become guardian to 12-year-old Toby, and is learning to keep bees, and local realtor Mike Moody, who Bree tries to avoid. When Panda, a security consultant, is hired by longtime client Temple, he brings the television diva to the island so she can lose weight while avoiding publicity. Lucy and Panda’s bickering, fighting their attraction, is very funny. Bree’s gradual realization that Mike is no longer the annoying boy she remembers is more heartwarming. Readalikes for this book would include Jennifer Crusie, Janet Evanovich’s romantic comedies, and Elizabeth Adler. Life in medieval England was nasty, brutish and short. Mr. Ackroyd does not spare on the horrid details of daily life in very old England. In the beginning, people, mostly Celts lived in mud huts with their livestock. If you got sick, there were the leaches and the bloodletting followed by a poultice of cattle dung applied to the affected area. There were constant wars between competing factions and soldiers were easily expendable. And this was before the “100 years war”, which actually lasted 114 years. If you got into trouble, really bad trouble, like William Wallace who dared to defy Edward Longshanks (see the movie Braveheart) you could be hanged, then dis-emboweled while you were still alive, then drawn and quartered which meant that your head and limbs were severed and put on display. If you were a heretic, which there were not many, you would be burned at the stake. If you were a King and were deposed by an opposing faction you could die by having a red hot poker shoved up your backside. Here is Richard the Lionheart, who was not so noble, but was really good with a sword. King John was so bad that the barons teamed up and presented him with the Magna Carta, the basis of all western law. The Black Death shows up in the 1300’s and a third of the population dies. The author postulates that it was not Bubonic Plague but instead was Anthrax, Influenza, or a form of Haemorrhagic Fever. The last part of the book is devoted to the Wars of the roses; the house of Lancaster vs. the house of York, the white rose vs. the red rose. In conclusion Ackroyd says : “when we look over the course of human affairs we are more likely than not to find only error and confusion. There is in fact a case for saying that human history, as it is generally described and understood, is the sum total of accident and unintended consequence.” I guess some things never change. There is a volume 2 to this history, “Tudors the history of England from Henry VIII to Elizabeth I, which will be published in October of 2013. Miss Henrietta Ingerton has grown up in a life of privilege in 1780s London, but forever shadowed by her proud, selfish cousin, Lady Catherine. In a Mansfield Park-esque manner, Henrietta is timid, always bowing to the needs of her cousin, whom she desperately wants attention from, until the dashing Lord Allenham pays tribute to both girls. Henrietta and Lady Catherine both fall for him, but it comes out that Lord Allenham loves Henrietta, but cannot marry her, as she has no fortune. This comes to spell tragedy for the couple, but Allenham whispers a word to her that she will always remember: SURVIVE. So this tale is a first-person recollection of Henrietta’s survival so she can one day be reunited with her beloved, who mysteriously disappeared. I was pleasantly surprised by this novel–it has twists and turns, and feels a little like both Moll Flanders and Mansfield Park, rolled into one. The author is a Regency historian, which makes it quite fun for historical fiction lovers.